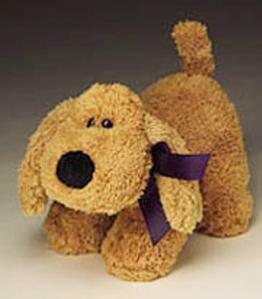 "Lucky" The Warm Lavender Dog can be microwaved for a warm, fragrant hug!! A heatable stuffed bundle of joy! Lucky is scented with the natural and calming essence of Lavender. Cover is cold water washable; just remove the insert and good to go in the wash.
You'll love this lovable warm-up dog and kids prefer it to a "hot water bottle" on the quesy tummy any day or night! They can use it to soothe their tummy and soothe their spirit as they cuddle up to "Lucky - the Warm Dog!"